Replace your 120v Honeywell RA890F or RA890G with no rewiring! The Quanta-Flame 5004-890 is just what technicians have waited for – the new technology equivalent of the Honeywell RA890 series. This time-saving control uses existing Honeywell sub-bases, flame rods, and UV scanners, but with significant upgrades, including an LED display and microprocessor control. Operates with existing Honeywell UV sensors and Flame Rods. 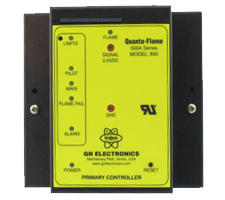 Do NOT use Quanta-Flame for ANY 100/208/230 VAC applications.